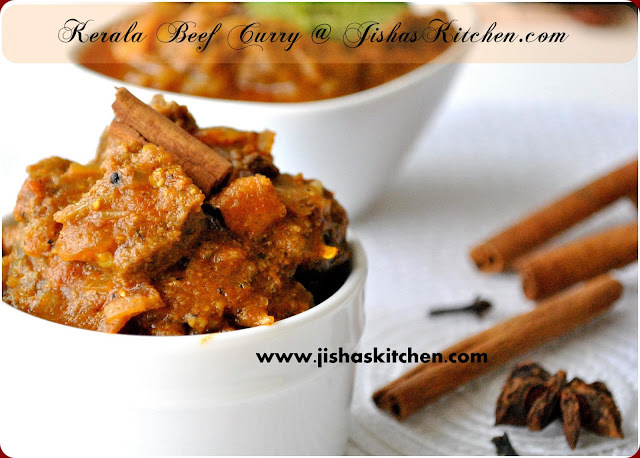 Today I am sharing the recipe of Kerala style beef curry which is an easy and delicious recipe. Some childhood memories comes to my mind whenever I have Beef Curry. My grand father is into hotel business and he is running a hotel back in Alappuzha(Kerala), India which is very much popular in that area. Beef curry is one of the popular dishes in my grandpa's hotel and I love having that Beef curry with freshly made parotta. Just typing about it made me drool..Lol..In my family, my aunt is the only person who can prepare beef curry similar to that. So I just called her and note down the recipe and made it today. And believe me, it was awesome. 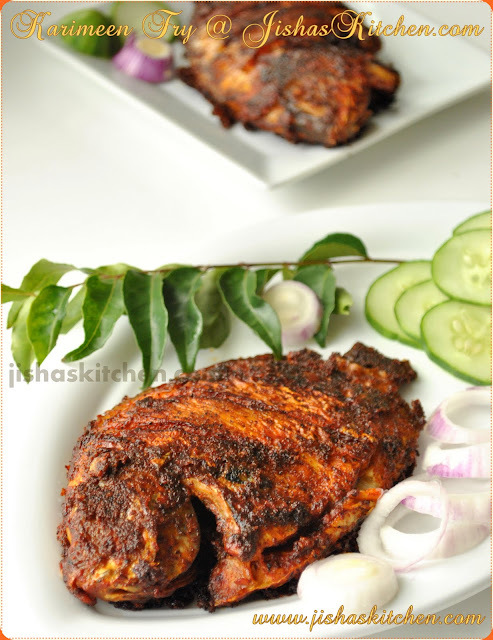 Since its a bit spicy, it gives the feel of "Thattukada Recipe". So do adjust the amount of Red chilly powder and Peppercorns according to your spice tolerance level. Wash and chop the beef to small pieces and allow it to drain. Then marinate the beef pieces with lemon juice, 1/4 tsp turmeric powder, 1/4 tsp pepper powder and salt and keep it aside for about 15 minutes. Meanwhile coarsely grind star anise, cloves, cardamom, cinnamon, peppercorns and fennel seeds. Then mix these ground spices with marinated beef pieces along with chopped shallots, crushed ginger and crushed garlic and cook by adding 1 1/4 cup of water till the beef pieces are cooked. Note: If you are using pressure cooker then cook till 3 whistles. I am using Hawkins pressure cooker. Then heat oil in a pan and add thinly sliced coconut pieces and fry till it becomes slightly brown in color and then transfer it to a paper towel. 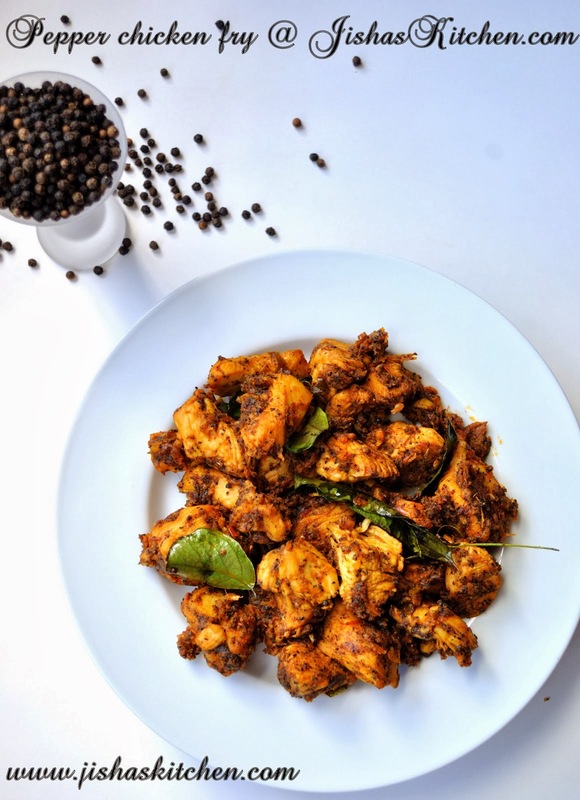 In the remaining oil, add mustard seeds and when it pops up, saute chopped onions and green chillies till the onions become light brown in color.Then lower the flame and add 3 tbsp coriander powder, 1 tbsp red chilly powder and 1/4 tsp turmeric powder and fry for about a minute. But do make sure not to burn the powder. Then add chopped tomato and fry till tomatoes are nicely done. Then add cooked beef and simmer for about 10-15 minutes or till the gravy thickens. Finally add chopped coriander leaves, curry leaves and fried coconut pieces and remove from the flame after 1-2 minutes. Enjoy with Appam / Rice / Chapathi / Dosa / Tapioca. 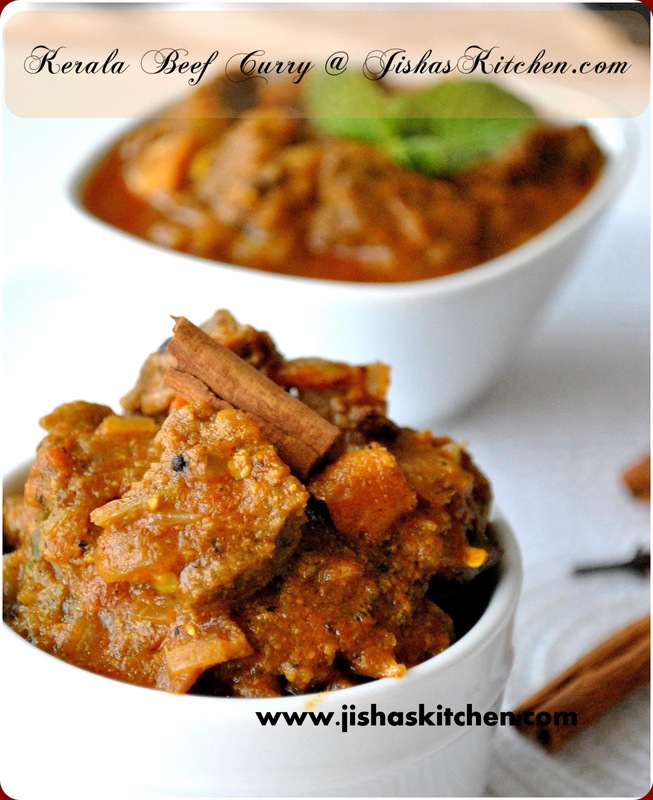 Mouthwatering beef curry...so grandpa's secret recipe is out huh!!! Beef curry looks spicy and delicious. It is really tempting for a veggie like me. 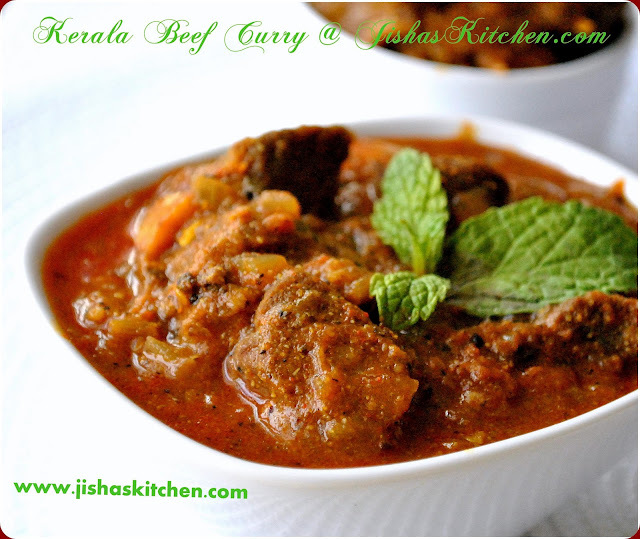 Beef curry looks perfect and delicious. awesome dish and amazing photography. tho i don't eat it...pics look great! oh honey.. gorgeous blog with yummilicious recipes.. The clicks look awesome and this beef curry is my hubby's favo.. so have bookmarked the recipe!! love to follow u.. do visit me sometime..! Beautiful clicks!! Just dropped in to say hi & after goin thru ur recipes, i simply loved ur space.. :) Glad to be following u now!!! Do drop into my space sometime..;)cya..
Made this tonight for dinner. Very tasty! Thank you for the recipe. Wow, I have been a silent follower and I rarely make comments. But I trried this recipe and it turned so good I thought i had to let you know. Let me add this to my Indian recipes Pinterest board. Thanks!